Ben Stein's new movie, Expelled: No Intelligence Allowed, has inspired my last few posts to address faith in a Creator vs. faith in science (atheistic science in particular). An oft-repeated demand from skeptical scientists has been "Show me God!" or "Give me measurable evidence for a Creator!" " I'm going to let you in on a little secret... Being the One is like being in love. No one can tell you you're in love, you just know it. Through and through. Balls to bones. " Many people assume that Neo represents Jesus Christ, which seems true in a lot of ways... but Neo more consistently resembles an average Christ-follower. 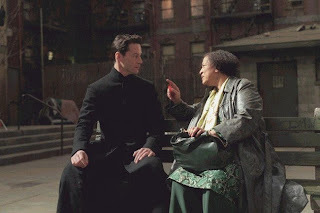 Consider Neo's faith-awakening for example... Jesus never needed anyone to say, "Hey Jesus, you're not gonna believe this, but you, like seriously, are God!" Later on Neo embraces such a powerful quality of faith that he out-fights the agents hand-to-hand, dodges bullets and even develops the ability to fly. This brings us to the most measurable aspect of faith. As Jesus said, "By their fruits shall you know them." Who wouldn't want to follow in Neo's footsteps? Who doesn't want to do the crazy things he can do? So also the substance of our faith will become evident by the fruits of our lives. If I believe in something inherently powerful, then the fruits of my life will be powerful (though not to my credit). On the same note, if we believe in something that is weak or evil or inherently misguided, then the quality of our lives will reflect this. In the same way that the genuine condition of our hearts surfaces eventually, so also quality of our lives over the years proves the substance of whatever we put their faith in. If you are a skeptical scientist and your mind immediately zeros in on manmade religion to fuel your opposing arguments (skeptical scientists tend to do this), then go ahead and apply the same rule... The fruit of any faith-based system (either scientific or theistic) will prove it's validity. Genuine Christianity will be almost invisible to the world, as true Christ-followers should prefer humility and self-abasement over self-promotion and artificial amplification. Does a certain belief-system wage war on people? Does it impose itself on people through intimidation and deceit? Does it say one thing and do another? If so, then this system is a man-made religion.